Surely it is farewell to Slaven Bilic following the Hammer horror show home defeat to newly promoted Brighton. Unfortunately there is great deal of repetition in any West Ham match review as the underlying problems that haunt the team’s performance continue to go unresolved. There have been times when these sub-par performances have resulted in narrow victories leading to a temporary sense that maybe things aren’t as bad as they seems. Then the cycle starts again and, to be honest, I expected another plundered 1-0 win from last night’s contest with Brighton. What we got, however, was quite possibly the most woeful, collective demonstration of West Ham’s inadequacies for some time. No player came out of it with any credit with the possible exception of Pablo Zabaleta who at least gave the impression that he was prepared to try for the whole ninety minutes. Post-match reviews frequently look back to individual errors when goals are conceded (and of course they do happen) but with West Ham it has largely been the absence of structure and organisation that has been the downfall; the players consistently look like a group of strangers who have rarely met before and have no idea as to what is expected of them or how they are supposed to support one another. We have by no means the worst squad in the league but I have rarely seen a team at this level do such little work off the ball. It is a total shambles. How To Turn It Around When You Don’t Know Where You’re Heading? Supporter’s views on the manager have become sharply polarised by now. There is the growing camp who believe that he is clueless, has no game-plan and cannot motivate or prepare his team properly either in terms of fitness or tactics. The other group is the Slav’s a nice guy camp who admire his passion, believe that he ‘gets us’ and that he should be given more time to turn things around. There is a third group, of course, which comprises the board who know that he is useless but are prepared to give him more time if they don’t have to pay compensation. If there was any hope of Bilic turning things around then it would need some clear direction of where we were heading in the first place. I have seen no evidence of this and only see a side that stumbles from one crisis to another. One report summed West Ham’s performance up as a confused mess and quite frankly that is how it has been since the start of last season. From where we are now it is impossible to see any way of avoiding a frantic relegation scrap (for which we are ill equipped) without changing the manager and coaching staff. As shocking as West Ham were, some credit has to go to the opposition for having a game-plan and sticking to it. It is a perfect example of what organisation and discipline can bring to a set of less talented players. Brighton are a team without any stars, reputations and egos. They are aware that it will be a difficult first season in the Premier League for them but that by putting in the effort, pulling together and sticking to a plan it gives them a shot at survival. Contrast that attitude to the West Ham one, which assumes that simply turning up is enough. I have written before that being the ‘fourth club in London’ is a potentially huge disadvantage for us as it attracts players of a big-time-Charlie persuasion who see themselves equivalent to their counterparts at Arsenal or Chelsea but without the need to put in the required level of graft. One imagines that our nice-guy manager is not so hot on player discipline and this is carried forward on to the pitch. Sure, he has petulantly fallen out with a few players over the years but that is not the same thing as having strict standards of behaviour. It should be no surprise that the multi-millionaire young men that make up the footballing elite nowadays need strong discipline to keep their feet firmly on the ground. On the evidence of social media, there is a very toxic atmosphere associated with the club at the present time. I have to say that this is not necessarily affirmed by those that I talk to in the real world who tend to apply more perspective. 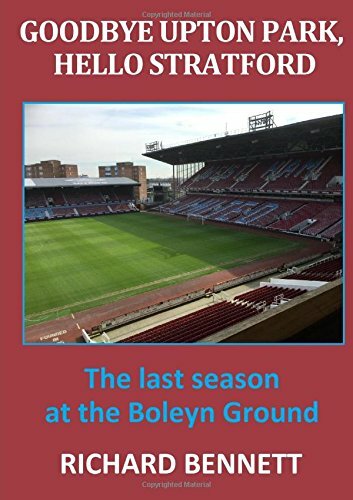 The more vociferous keyboard supporters lay much of the blame for the current malaise at the door of the Board or the move to the London Stadium; or both! Everyone, of course, is entitled to their opinion but the reality is that neither of those things are going change any time soon without time travel. Further, neither of those factors are responsible for the poor football that is being served up week on week. Performances on the pitch are directly down to the manager and his coaching staff who are tasked with getting the best out of the resources available. We have not been plucky losers but lethargic pushovers. As painful as the defeat to Brighton was, if it heralds, as it should do, the end of the manager’s reign then it would have been a medicine worth taking. Where the board are culpable, in my view, is in continuing to oversee the amateurish approach taken to the footballing side of the club; in the long term it will be a more important factor for revenue growth than selling a few more Hammer’s souvenirs. Until a long term football strategy is developed (with Sullivan stepping back from his de facto Director of Football role) and there is proper investment into training and youth development we will continue to punch well below our weight. It will be hugely disappointing if Bilic is still in charge by the time our next game comes around. I do not profess to have the low down on what managers are available but I am hoping (maybe optimistically) that soundings have been taken and the market scoured to find the right replacement. Whoever comes in (and please not serial failure Alan Pardew) needs to have a tactical brain, obsessed with fitness and be strong on discipline. I remain convinced that a decent manager can create a competent top half team from the under-performing collection of players that would be at his disposal. Personally, I would liked to have gone for Marco Silva in the summer but that ship has sailed. Maybe Roberto Mancini is the man.